I have used the same method for many years now. Who would know that a huge mistake could turn out to be something useful years later? Maybe many ideas come to use that way, this one for sure did. We were boiling shrimp with some friends when I lived in Louisiana. Being young and trying not to show it, actually taught me two things in the same weekend. One: do not put shrimp down the garbage disposal. Two: the hot mixture of spices kills your grass almost instantly! I do pretty much everything I can organically. If I still lived in the South where you boil shrimp or crawfish often, I would just use the left over water to pour on all my weeds. Since I have moved from there, now I make a special "brew" to kill all of those weeds, without hurting the environment. The ones that come up through cracks in driveway or close to the steps can't hide from this hot and spicy weed killer. You take Cajun pepper (red pepper will do) and hot sauce, vinegar can also be added if you have extra. Bring it to a boil and pour directly on any area where you want everything to die. Be very careful not to get it on grass you want to stay alive. Anything this hot mixture is put on will die (ants don't like it either). If you make more then you use at any given time, put in bottle for next time. This works cool, but I have found it works faster when boiled, steaming hot. If you aren't wanting to see results immediately, know it works after mixture has cooled off. I add a half jar of Cajun or red pepper and half a bottle of hot sauce to a large pot of water. You just know it is ready when your eyes are watering and the room fills with the smell of the mixture. I have added left over pickle juice, vinegar, even jalapeno juice to this, depending what is left over in my fridge or cabinets. This works and works well without hurting anything in the air; animals tend not to eat in that area but it doesn't hurt them. If you do boil shrimp, crab or crawfish, please drain the water where any unwanted weeds are so you get double use out of something you would just throw away. At most markets that sell seafood, they have bags with seasoning already in it. I always ask this time of the year to let me know if any are past the selling date. A couple of times I got lucky and was able to get the boil in bag seasoning for a dollar. Any of these ingredients can be found at the Dollar Store. With no more worries about pulling weeds, maybe you will have more time to enjoy this beautiful time of the year. One can just pour hot water on plants to get rid of weeds. But, I wish people would really look at all the plants growing in their yards and ask why. Plants like dandelions have deep tap roots. They break up the soil and bring minerals up to the top soil. Why not just mow them down after they've bloomed. They are pretty. Plants tell you a lot about the condition of your land. We've been taught to prefer manicured, scrubbed yards. There are no fruit trees anymore which could have something to do with the bee problem. No berry bushes, and a few set apart plants. Why not go crazy and go for lush? Weeds would get crowded out. To kill dandelions, pour vodka into spray bottle and spray on dandelions on a sunny day. Add a little dish liquid for more stubborn weeds. Instead of using harsh chemicals that can be lethal to children and animals and quite expensive, grab a nice big pot and fill it with water. Bring water to a rapid boil and pour on weeds. This literally fries the roots and the active growing weeds nearly instantly. Here is a natural weed killer recipe. I feed all of our wildlife here in the yard. I have a feeder for peanuts for the squirrels, they make a mess with the peanut shells, so I got the bright idea of using them for weed control. I put them around the flowers, and have started using them around my vegetable plants. We would like to try the solution of vinegar, Epsom salt, and dish soap, but are concerned if it will kill everything. We do not want "volunteers" oaks, coffeeberry, etc. to be killed. Thanks! First of all, you'd use regular salt; epsom salt is actually a plant food. Vinegar will render the soil sterile, meaning that nothing at all will grow there, maybe for decades (it stays in the soil). It will also render the soil sterile if a rain washes it to another place. It is best NOT to use it if you ever want anything to grow, ever. And yes, it will kill "volunteers." Just lightly spray the leaves with soapy (blue dawn dishwash soap) water on a really sunny day or use boiling water. I've misplaced a very effective recipe for an natural weed killer. It used Pine Sol as one of the ingredients. Would greatly appreciate if anyone is familiar with this recipe. You can use cheap white vinegar, just pour it directly, out of the bottle, on the weeds. The next morning... dead weeds. It works. I use it on cracks in the driveway and not in big spaces. But it works! I use 1 gallon white vinegar, 1 pound of salt, and a generous squirt of lemon dish detergent mixed in a watering can. Stir the mix well and sprinkle on the unwanted weeds. They are dead by the next morning and the best part is that it won't hurt my dogs! Tea kettle with boiling water also works. Just be careful and not spill it on your toes. You can spray your yard with Dawn Dish detergent, and Pine Sol. Equal amounts of both. Use a sprayer bottel hooked to your hose. This mixture takes care of fleas, beetles, and destroys ant hills. It also makes your grass greener, is safe on your flowers and plants,I have not used this,good luck. I use white vinegar, the cheaper the brand the better. Save the pinesol mixes to spray your trash cans, theones you put out for pick up. The pine sol smell makes the trash less nasty to your nose and totally nasty to the critters like racoons and skunks who may be in search of a free meal. Be Careful with the vinegar. Don't get it on any plants you want to keep. Otherwise it's totally safe for you, your pets, and the environment. Is there a homemade recipe for killing weeds in the lawn without killing the grass? I am looking for a recipe for organic weed and grass killer. Dandelion foliage withering, just 24 hours after a vinegar application. Kills Weeds and Prevents. Kills the Root - Guaranteed! Organic Pest Control Products. Get Pest Free Homes Instantly. Buy Now! If you're battling lawn weeds, take care to apply the vinegar directly onto the weeds themselves, not letting it come into contact with your grass. Why? Because the fact that vinegar is a natural weed killer doesn't mean it can't be harmful if misused. Vinegar is non-selective, and this natural weed killer can harm your grass! 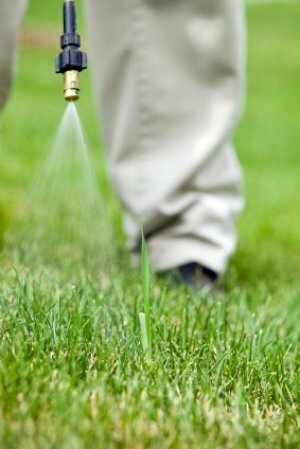 To avoid damage to grass, consider "painting" the vinegar directly onto weeds with a brush. If you do spray with vinegar, don't pull the trigger until you're right up close to the targeted weed. 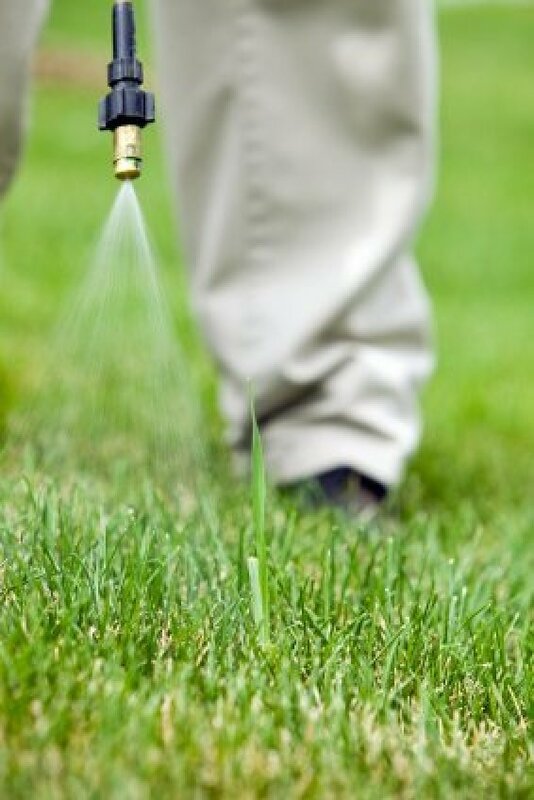 Don't spray on a windy day, as the wind could carry your vinegar spray where you don't want it to go -- on your grass. Because of this limitation, I don't think of vinegar as being an especially effective natural weed killer for lawn areas. It makes more sense to use vinegar in areas where lawn grass and other landscaping plants won't be in the way, such as on patios or walkways (where you have weeds pushing up through cracks). But if you're already in the process of digging a dandelion out of the lawn, it wouldn't hurt to supplement your efforts with vinegar. After you've removed as much of the taproot as possible, carefully pour some vinegar into the hole. The vinegar will seep down into the soil, killing any portions of taproot you may have missed. Afterwards, shovel soil into the hole and sow grass seed on top, lest any opportunistic weed seeds should fill the vacuum. There's another limitation in using vinegar as a natural weed killer, but this limitation extends to chemical weed killers, as well: namely, that you'll probably have to re-apply the vinegar to get the job done, as weeds often refuse to go quietly. This is especially true of established perennial weeds, toughened by years of coping with environmental challenges; vinegar will be more effective on younger weeds. But considering that vinegar is safe and relatively inexpensive, this objection is hardly a telling argument against the use of vinegar as a natural weed killer. If your goal is to use a natural weed killer, one assumes that you'll be motivated to make repeated applications, as necessary. When practicing natural weed control, take to heart the dictum, Know thine enemy! Study up on the weeds you're battling before you use the vinegar on them. Target annual weeds with your vinegar natural weed killer before they set seed, to prevent them from spawning a new generation to give you headaches next year. By contrast, early fall is the best time to use this natural weed killer on perennial weeds. Early fall is when you'll want to apply vinegar to dandelions (but snap off the flowers whenever they appear, to prevent them from going to seed in the meantime). Dandelions, although their leaves die back in winter, do live on through their roots. So preventing them from going to seed isn't enough. Fortunately, knowing a little botany can help you considerably in your battle with perennial weeds like dandelions. You see, in early fall, nutrients are transferred from the dandelion leaves down to the roots. This transfer, which continues until the first killing frost, presents you with an opportunity to hit dandelions where it really hurts! Vinegar natural weed killer applied during this time is absorbed by the leaves and passed on to the roots, following the same path down as the nutrients. The plants are killed -- naturally. Repeated applications may be necessary. Listen to your local forecast, and find out when your region will be experiencing a few continuous days of sunshine. At the beginning of this period, spray or paint the vinegar onto the weeds you wish to kill. 1.You need to saturate the weeds' leaves with the vinegar, and rain would wash too much of the vinegar off the foliage. 2.The real damage to the sprayed weeds begins the next couple of days after the application, when the sun hits the leaves. Some people who use vinegar as a natural weed killer like to boil the vinegar, prior to application. Through such boiling, you may actually be able to gain a concentrate higher in acetic acid, although I haven't yet experimented with this option in any scientific way. But it certainly can't hurt to boil the vinegar; in fact, many folks report success killing weeds by simply pouring scalding water on weeds! So I suppose the use of boiled vinegar allows you to attack weeds on an additional front. It is possible to buy products with a higher acetic acid content than that found in ordinary vinegar. Such products can be purchased at farmer's stores or from restaurant supply businesses. But the potency of these acetic acid products can render them less safe to use than household vinegar. To me, that puts them at odds with the whole concept of using "natural weed killers." Besides, you have to go out of your way to find these products, and the idea behind the present article was to introduce a handy natural weed killer, something you can just pull off a kitchen shelf and experiment with. Those of you who have held an ongoing grudge against vinegar for its ability to make your mouth pucker may finally be able to grant vinegar forgiveness. For that same sourness makes vinegar the natural weed killer of choice for organic gardening. Vinegar can also be used for cleaning purposes around the home, as an alternative to chemical cleaners. So if you rarely open that vinegar jug for purposes of seasoning your food, don't despair: The uses for vinegar extend well beyond the culinary. I like the painting it on scenario! Will try it this spring. Put it into a cheap $12 garden pump-sprayer & spray the area... Or you can pour it directly on to the ground. If your heat the vinegar up it works even better... The very best vinegar is a special stronger-acid type that's sold at plant nurseries, but any kind of vinegar will work. * Keep your animals inside while using the stove & watch out for your neighbors animals that may wander into your yard, you don't want them to be scalded! I believe corn bran is now used to kill weeds, used like mulch. Covering grass with a mat, boards, or black plastic will kill it. How much grass influences the choice. I have a lot of grass right up next to my house and azaleas not too far from the house. Will the homemade Roundup seep over into the azaleas? I have already killed some of the grass. So far, the azalea is still alive, but I was wondering if anyone knew about this because I have more grass to kill with several more plants. I thought I saw a homemade recipe to kill vegetation and weeds using rubbing alcohol. Can you help me? Or is there any other recipe that would kill thistles, etc.? Vinegar. I read something about vinegar with a mix of epsom salts. But now I can not re-find the link! Shucks. But try looking it up on gardening sites that have a dot.ORG ending. That may help. In the meantime I will look again. Is there a formula for homemade weed killer? Vinegar works well as a weed killer. Put it in a spray bottle, turn the sprayer so it shoots out in a stream, and aim it at the bottom of the plant. Here's a good one I came across the other day! What is the best homemade weed killer? I've used bleach, but I don't like to because I doubt it's safe for the environment. Vinegar works or boiling water but then you will kill the good things growing around it too. If you have individual weeds you want to kill, the best thing to do is take one of those sponge paint brushes (preferably a small one) and dip it in Roundup and "paint" the leaves of the weed. It takes it down to the root and does not affect the grass around it. It is time consuming but it works. How do I kill a large patch of Agapanthus using only natural ingredients? I want to plant there afterwards as well. Any suggestions? Does anyone know where corn gluten can be purchased? I have been told it is used in Oklahoma, spread like grass seed. It apparently feeds the grass and kills the weeds. What is the best homemade remedy to kill weeds permanently around the house. I am looking for a cure to kill the bind weed around my farm. I haven't minded it too much except that it is moving into my flower beds and that is a no, no. I've tried digging it, but there is just too much of it. How do I make my own weed killer? Will the recipe of 2 cups Epsom salt, 1 gallon white vinegar and 1/2 cup blue Dawn detergent kill my centipede grass or flowers? I use vinegar, ammonium sulphate, salt, and liquid soap to kill my weeds. Is that better or not? What is the most highly effective homemade weed killer? What is the best thing to use for Florida betany weed commonly known as rattlesnake weed grass? It is very invasive and spreads fast. What is the weed killer recipe that includes gin?